The Connect Studio, an apparel and garment manufacturing unit, based in Dimapur. Although it was launched only in 2013, Ringo Odyuo has been in the retail business for about 12 years. 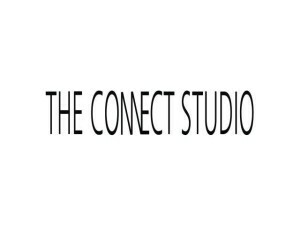 The Connect Studio was formed with vision to become a premium conglomerate, providing solution to the textile and retail industry, cater to the ever changing fashion industry and be a frontrunner in manufacturing products of international standard, support indigenous works and designs, and create maximum value for their customers. 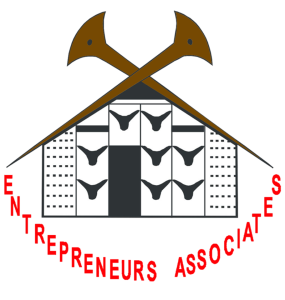 Entrepreneurs Associates (EA), an organization of the First Generation Entrepreneurs (FGE), established in the year 2000. EA has now provided micro finance to more than 5000 youth in the last 15 years, linked up members, acted as business facilitators to banks, and also provided numerous entrepreneurship trainings. Lozi Hyndai is a premium Hyundai car dealership always endeavors to achieve highest level of customer satisfaction and improving the buying experience for our customers. They have best of the sales staff to cater all your car buying needs and also have the skilled professional to take care for your car services and other requirements. Lozi Hyndai not only sells Hyundai car, we also deals in Used Cars, Insurance, Finance, Accessories. We take care of your every need while buying a car. With state-of-the-art workshops coupled with the company-trained technicians, it offers you an instant, efficient and personalized customer service. 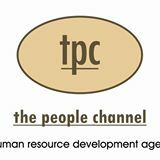 The People Channel is a human resource development agency, which was established in the year 2005 and is a pioneer in skill building and placements in the North East of India. 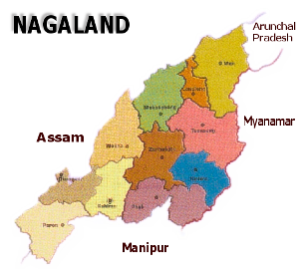 Overview: Nagaland is among the seven North-Eastern states and is located in India’s farthest east side. The state is flanked by Myanmar in the east, Arunachal Pradesh in the north, Assam in the west and Manipur in the south. The state has considerable resources of natural minerals, petroleum and hydropower. The agro-climatic conditions in Nagaland provide commercial opportunities for floriculture and horticulture. The state has 650 indigenous species of medicinal and aromatic plants. Honey production in the state stood at 623.40 MT during 2014-15 and is expected to reach 1,000 MT by the end of the 12th Five Year Plan period. Bamboo is found extensively in Nagaland, with bamboo growing stock covering nearly five per cent of the total stock in the country. Nagaland also has enormous potential in raw silk production, and aims to increase silk production to 1,700 MT over the 12th Five-Year Plan period (2012-17) from 300 MT. Agri and allied sector contribution to the economic output stood at 20 per cent and expected to reach 28 per cent by 2025. About 71 per cent of the state’s population is engaged in farming. The state provides institutional support through various central and state government agencies viz., North East Council, Ministry of Development of North Eastern Region and Nagaland Industrial Development Council. The state offers excellent policy and fiscal incentives for agro-based and forest-based industries, horticulture, food processing, mining, tourism, and the handlooms and handicrafts sectors. Industrial centres and special economic zones (SEZs) are being developed to enhance the marketability of products. Economic Aspects of Nagaland: The Gross State Domestic Product (GSDP) of Nagaland was about ₹12065 crore (US$1.8 billion) in 2011-12. Nagaland’s GSDP grew at 9.9% compounded annually for a decade, thus more than doubling the per capita income. Nagaland has a high literacy rate of 80.1 per cent. Majority of the population in the state speaks English, which is the official language of the state. The state offers technical and medical education. Nevertheless, agriculture and forestry contribute majority of Nagaland’s Gross Domestic Product. The state is rich in mineral resources such as coal, limestone, iron, nickel, cobalt, chromium, and marble. Nagaland has a recoverable reserve of limestone of 1,000 million tonnes plus a large untapped resource of marble and handicraft stone. Kopou phool (Rhynchostylis retusa), a type of orchid, in bloom. Nagaland is home to 396 species of orchids, belonging to 92 genera of which 54 having horticultural and medicinal economic importance. Kopou is also used for festive hairstyle decoration by women in India’s northeast. Most of state’s population, about 68 per cent of the total, depends on rural cultivation. The main crops of the state are rice, millet, maize, and pulses. Cash crops, like sugarcane and potato, are also grown in some parts. Plantation crops such as premium coffee, cardamom, and tea are grown in hilly areas in small quantities, but a large growth potential. Most people cultivate rice as it is the main staple diet of the people. About 80% of the cropped area is dedicated to rice. Oilseeds are another, higher income crop gaining ground in Nagaland. Forestry is also an important source of income. Cottage industries such as weaving, woodwork, and pottery are also an important source of revenue. Tourism: The picturesque landscape of the hilly state of Nagaland and its manifold cultures and customs and the salubrious climate offer vast potential for development of tourism Industry in the state. Each of the 16 major tribes has their own distinctive colorful costumes, festivals, dances and music. Nagaland is aptly called “land of festivals”. The rich art and culture of the people is a major tourist attraction. The Government of India’s decision to release the RAP will open new opportunities for development of tourism industry. Opportunities exist in eco-tourism, adventure tourism, anthropological tourism and ethnic culture tourism, setting up of tourist resorts, private air taxi service, tour operation, augmentation of present tourist facilities, etc. Handloom and Handicrafts: Handicrafts and handloom sector in Nagaland have vast potential for growth due to the availability of abundant skills, raw materials and rich cultural traditions of its people. The natural skills of the Nagas lie in basketry, pottery, cultivation, spinning and weaving, carving, dyeing metal work etc. the Nagas are inherently skilled people and their handicrafts and handloom products are well known for the beauty and intricacies of work. The art of woodcarving is as old as the history of the Nagas being associated with religious beliefs and practices. Cane and Bamboo grow abundantly in the forests and hills of the state. With the ready availability of raw materials, Nagas became expert basket makers. Basketry is carried out in almost every village of the state. Besides basketry, artisans of the state have also started making furniture and a wide variety of decorative items. The main traditional crafts of the state are its rich handloom and handicraft, which have widespread appeal and demand in the domestic as well as offshore markets. Traditional techniques for weaving on loin-looms or use of primitive tools are labor intensive and time consuming. With the easy availability and applicability of modern techniques and tools, there is substantial scope for growth in this sector. Agriculture and allied sector: Nagaland has basically an agrarian economy. Over 70% of the population is dependent on agriculture. The main crops are rice, millet, maize and pulses. Cash crops like sugarcane and potato are also becoming popular. Coffee, cardamom and tea are grown as plantation crops in Nagaland. Rice is the dominant crop and also the staple diet of the people. Of the gross cropped area under food grains, rice accounts for about 70%. Oil seeds are also an important crop. It includes rapeseed, mustard etc. Coffee, cardamom and tea are grown as plantation crops in Nagaland. Principal crops are Arums, yams, millet, maize, potatoes and sugarcane. Vegetable crops are melon, cucumbers, spinach leaf, mustard, onion, chillies, carrots, tomatoes, brinjal etc. The agriculture and allied sectors in Nagaland offer good inputs for development of a host of industries which could include: floriculture, horticulture, rubber plantation and allied industries, sericulture, tea cultivation and processing, bamboo shoot preservation, mushroom cultivation and processing, piggery, poultry, etc. Horticulture: Horticulture is considered to be the most suitable farming enterprise in the state. With favorable agro-climatic and geophysical conditions, it produces a variety of organic sub-tropical & temperate fruits & vegetables. The total area available under horticultural crops is 6299 hectares and further area of around 4000 hectares is being brought under horticulture farming. Presently most of the produce is marketed in the local markets leading to huge volume of surplus and wastage. The Government of India accords top priority to preservation and processing of fruits and vegetables and has introduced several schemes of assistance for Fruits & Vegetable processing. Animal husbandry and meat processing: Meat production is highly decentralized and there are no organized slaughterhouses. Meat (Beef, pork, poultry, mutton) consumption levels are high in Nagaland. However, local supplies are inadequate and there is inflow of animals from other states. The State has high potential for diary and allied products as well as for processing of hides and skins for leather industry. Presently, scientific processing of Poultry and other meat products is lacking in the State. There is huge scope for setting up modern abattoir and other meat processing units in the State for production and marketing of other value added dairy products. Sericulture: The agro-climatic condition is very favorable for the development of Sericulture in the State. There are 34 Sericulture farms, which provide technical and other supports like training of farmers, distribution of improved varieties of saplings/seedlings/supply of disease free layings (DFLs) etc. The Government has identified Eri culture as the thrust area for development of sericulture in the State by bringing 2000 acres of land under Eri culture in the next three years. Through this the production of cocoons is targeted to yield 80 MT. Floriculture: Floriculture can be taken up as a viable industry in the State. The wide variety of orchids available in the State can be exported to earn valuable foreign exchange. Many species of orchids are available in Nagaland, which has tremendous commercial potential. There is scope to grow exotic and new varieties of orchids through tissue. With the declaration of Guwahati as international Airport, cut flowers can also be exported from the State. Forest based industries: Nagaland is rich in forest produces such as timber, cane and bamboo, flora and fauna. Almost all the vacant fallow lands are being rapidly covered with various high value timber varieties as the people have fully realized the commercial and ecological importance of forests. Investment potential exists for setting up of farms for production and promotion of Non-wood timber products with efficient marketing network. Bamboo based industries: The North east region of India has the maximum concentration of bamboo in India owing to its climatic conditions. There is no dearth of bamboo. At present bamboo is put only to traditional use, handicrafts and papermaking. Now the Government of India has announced the bamboo mission for promoting bamboo based industries in the North East Region. Machine made bamboo sticks, blades, ply, etc are some products, which have substantial potential. There are 400 exporters in India who together export Agarbatti (or incense sticks) worth Rs.800 crores. Of late multinational companies have introduced machine made agarbatti for the India market. As a result all other leading Indian manufacturers are using machine made round bamboo sticks for making agarbatti. It is estimated that the present requirement of round bamboo sticks is 2000 tonnes per month. Medicinal and aromatic plants: With the favorable agro climatic conditions, Medicinal Herbs and Plants are abundantly available in the hilly regions of the State. Medicinal Plants which could be considered for cultivation in Nagaland are Aconitum ferox, Aconitum heterophyllum, Aquilaria agallocha, Artemiszia annua, Dioscorea floribunda, Gloriosa superba, Hedychium spicatum, Lycopodium clavatum, Nardostachys jatamansi, Panax-pseudoginseng, Picrorhiza kurron, Piper longum, Piper nigrum, Podophyllum hexunddrum, Pogostemon cablin, Smilax china, Tagetes Minuta, Taxuz bacata and Valeriana wallichii. Scientific harnessing of this potential in the private sector can yield good results. One of the most valuable medicinal plants commonly known as Ginseng, which has tremendous export potential is also found here. Mineral based industries: Nagaland is rich in mineral resources. Explorations carried by the state Geology & Mining Department, Geological Survey of India, ONGC Ltd., Atomic Minerals Division and Central Ground Water Board have established the following mineral reserves which can be exploited for commercially purposes: Petroleum & Natural Gas, High grade limestone, Marble and dimensional/decorative stones, Coal and Nickel-Cobalt-Chromium bearing ore. The huge reserves of more than 1000 million tons of high chemical grade limestone in the eastern Nagaland is a major prospect for setting up of mineral resource based industries. Nagaland offers investment potentialities in terms of exploration as well as exploitation including development of mineral based industries, which have high export potential. The possibilities include multi-disciplinary explorations for precious metals in the Ophiolites and Fossil fuels in the Sedimentary basins. Evolving Metallurgical know-how for utilization of multi-metal deposits of Nickle-Cobalt-Chromium-Iron. Exploration and production of Oil & Natural Gas including setting up of Refinery, Petro-chemical Industries, gas based power generation, etc. and setting up of medium to large industries based on very high grade limestone/marble deposits. Transportation: The major mode of transportation in Nagaland is by road. Pliable road network and State Highways link with all districts as well as far-flung areas. Nagaland is also connected to the rest of the country by National Highways. Development of roads specifically in the notified industrial zones is being accorded priority. Dimapur, the commercial hub is also connected both by Rail as well as by Air. Efforts are also being made to extend the railway network to other interior parts of the state. Telecommunication: The telecommunication network in the state is growing at a rapid rate. With the up-gradation of the Dimapur Telecom District to that of a Telecom Circle headed by a Chief General Manager, the telecommunication services in the state is expected to improve further. The advent of Internet service has also linked this remote state with the global information highway. Media: International & National editions of Newspapers are available regularly. The local print media in both the English as well as the local dialect segment has also grown substantially. Further, easy access to almost all satellite broadcasts of all major international and national networks is available. Hospitality: Effort by both the private as well as state owned sectors in setting up decent hospitality facilities of high standard has now made it convenient for business travelers as well as tourists to visit the state without facing any accommodation problems. Postal services: The state has a wide postal network with post offices spread throughout the state offering a wide range of value added services like satellite based money order services, courier & speed post services besides the other normal services. Potential Areas for Exports: Forest produce, Cane and Bamboo handicrafts (Machine made Bamboo sticks, blades, ply), Wood produce and artifacts, Handloom and Handicrafts, Organic, sub tropical fruits and vegetable. I have the deepest admiration for the great Naga people for their extraordinary support to the peace efforts. 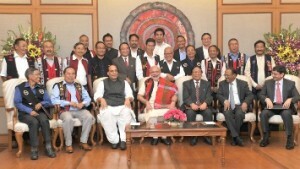 I compliment the National Socialist Council of Nagaland for maintaining the ceasefire agreement for nearly two decades, with a sense of honour that defines the great Naga people. My relationship with the North East has been deep. I have travelled to Nagaland on many occasions. I have been deeply impressed by the rich and diverse culture and the unique way of life of the Naga people. It makes not only our nation, but also the world a more beautiful place. The Naga courage and commitment are legendary. Equally, they represent the highest levels of humanism. Their system of village administration and grass-root democracy should be an inspiration for the rest of the country. The respect for the infirm and elders, the status of women in society, sensitivity to Mother Nature, and the emphasis on social equality is a natural way of Naga life. These are values that should constitute the foundation of the society that we all seek. Since becoming Prime Minister last year, peace, security and economic transformation of North East has been amongst my highest priorities. It is also at the heart of my foreign policy, especially the ‘Act East’ Policy. Today’s agreement is a shining example of what we can achieve when we deal with each other in a spirit of equality and respect, trust and confidence; when we seek to understand concerns and try to address aspirations; when we leave the path of dispute and take the high road of dialogue. It is a lesson and an inspiration in our troubled world. Today, we mark not merely the end of a problem, but the beginning of a new future. We will not only try to heal wounds and resolve problems, but also be your partner as you restore your pride and prestige. Today, to the leaders and the people of Nagaland, I say this: You will not only build a bright future for Nagaland, but your talents, traditions and efforts will also contribute to making the nation stronger, more secure, more inclusive and more prosperous. You are also the guardians of our eastern frontiers and our gateway to the world beyond. Equally, the rest of the nation will join you in shaping a future of dignity, opportunity and prosperity for the Naga people. Smriti Inaugurates MGAHD in Nagaland: Few days back Ms. Smriti Zubin Irani, Union minister for Human Resource and Development on Friday inaugurated the Mahatma Gandhi Academy of Human Development (MGAHD) at Chuchuyimlang, Mokokchung district. The academy is a joint initiative of Natwar Thakkar, founder Nagaland Gandhi Ashram (NGA) Chuchuyimlang and Tata Institute of Social Sciences (TISS) Mumbai. On the occasion Ms Smriti Irani said that such prestigious institute would not only benefit the Nagas but the North Eastern region and the country as a whole she also encouraged and enlightened the youngsters to take part in the Prime Minister Mudra Bank Yojna, which provides loans for upcoming entrepreneurs and youths to establish themselves as employed citizens and build a self sufficient future. The scheme allows people to take loans up to Rs. 10 lakh to start businesses. With a vision to embark on a process to instill the spirit of innovation and use of technology for impacting positive change in the society with target audience comprising of students, entrepreneurs, NGOs, government departments and industry professionals, E-Naga Summit was held here today. VK Singh launches Mudra loans, Says it will boost small enterprise in Nagaland: On 29th Sep, Union Minister of State for External Affairs, Gen (Retd) Dr VK Singh inaugurated the Mudra Mega Credit Camp, a loan plan to fund small business activities under manufacturing, service, small business and trade which is under Pradhan Mantri Mudra Yojana (PMMY) scheme an initiative of Prime Minister Narendra Modi at Town Hall Dimapur. Singh, while addressing the participants at the inauguration of Mudra Mega Credit Camp, said that the program was aimed at providing benefit to people who otherwise do not have means for avail loans and secure borrowers from money lenders. There are 977 beneficiaries of the Micro Units Development & Refinance Agency Limited (MUDRA) loan in all banks in Nagaland out of which, a sum of Rs.2.51 crore has been disbursed already. SBI being the Convenor Bank of Nagaland has lead from the front and its 64 branches have so far sanctioned 492 Mudra loans amounting to Rs.1.36 crore. MUDRA has a mission to create inclusive, sustainable and value based partner institutions in achieving economic success and financial security. The purpose of MUDRA is to attain development in an inclusive and sustainable manner by supporting and promoting partner institutions and creating an ecosystem of growth for micro enterprises sector. Under the aegis of PMMY, MUDRA has created three loan categories: Shishu-covering loans upto Rs.50, 000, Kishor- covering loans above Rs. 50, 000 to Rs.5 lakh, Tarun: covering loans above Rs.5 lakh and upto Rs.10 lakh. E Naga Summit: In the month of May, the E Naga summit was held in Nagaland, it is an initiative of the Nagaland department of Information Technology and Communication, in collaboration with the Confederation of Indian Industries (CII) and it is being held under the theme “Ideas and Solutions to transform North East India through Information Communication Technology”. The summit was also marked with the signing of Memorandum of Understanding between the State Government and the Software Technology Parks of India to establish a software park in Kohima and Dimapur. 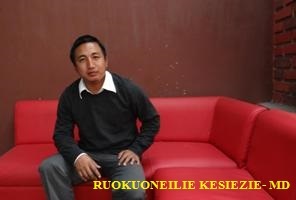 Nagaland Govt, YouthNet start ‘Impact 5000 by 18’: Department of Youth Resources and Sports of Nagaland Govt in collaboration with YouthNet, an NGO based in Kohima, Nagaland has launched a five-year campaign on entrepreneurship and employment ‘Impact 5000 by 18’, the campaign aims to enhance business, entrepreneurship and employability skills of 5000 youth of Nagaland by 2018, through various programs. The programs will be conducted through the YouthNet Centre for Entrepreneurship and Employment. The goals of the campaign are to promote entrepreneurial mindsets, help build an entrepreneurial ecosystem and enable co-creation of socio-economic prosperity. The planned activities include skill development in the agro sector, fine arts, handloom, handicrafts, livestock rearing, business and entrepreneurship development. DoNER minister launches e-portal for development projects of NE region: Few days back a new hi-tech online “e- Portal” has been launched for submission, surveillance and follow up of development projects relating to Northeast falling under the category of Non-Lapsable Central Pool of Resource (NLCPR). The portal was launched by Union Minister of State (Independent Charge) for Development of North Eastern Region (DoNER), MoS PMO, Personnel, Public Grievances, Pensions, Atomic Energy and Space, Jitendra Singh. The new portal will help in keeping track of various stages of project activities among different departments, ministries including planning department of north eastern state governments and line ministries of central government. It will also avoid complaints regarding delays or extraneous considerations including corruption, he added. In order to overcome delays, the portal will be programmed to send automatic computerised reminders to the state governments and others concerned.